ACCESS® LORADO® - A Streamlined, Low Profile Tonneau Cover. Our ACCESS® LORADO® soft tonneau cover offers the same quality components, easy to install applications and simple operation as the respected Access® Roll-Up Cover but with a low-profile design that complements the sleek contours of your truck. This soft tonneau cover sits only 1” above the truck bed. The ACCESS® LORADO® Tonneau Cover comes with our Premium Cover™ Warranty. 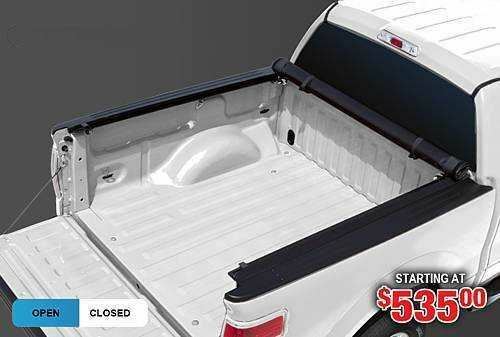 ACCESS® LORADO® soft tonneau cover will accommodate bed rails, under rail bed liners, tie downs, bed caps and tailgate protectors. ACCESS® LORADO® cover pays for itself in the first 3 years of ownership by boosting your gas mileage by as much as 10%! If you’re looking for a high quality, soft, durable low profile truck bed cover, the ACCESS® LORADO® Roll-Up Tonneau Cover is a great choice. The ACCESS® LORADO® Cover combines all of the convenience and benefits of a soft roll-up tonneau cover in a stylish, soft, low-profile design. Using a soft tonneau cover like the LORADO® allows you to transport a lot of equipment in the back of your truck, and also keep your truck looking sharp. That’s because it is a low profile tonneau cover, hiding all the equipment under it while blending in with your truck’s excellent style as you drive down the road. It will help keep your equipment protected from the sun, wind, rain and theft when you roll shut the ACCESS® LORADO® tonneau cover and lock the tailgate. If you prefer a more streamlined, low profile look for your pickup truck, but don’t want to sacrifice performance, the ACCESS® LORADO® Roll-Up Tonneau Cover is a perfect option.